Description: Research pilot Rogers E. Smith is shown here in front of the SR-71 Blackbird he flew for NASA. 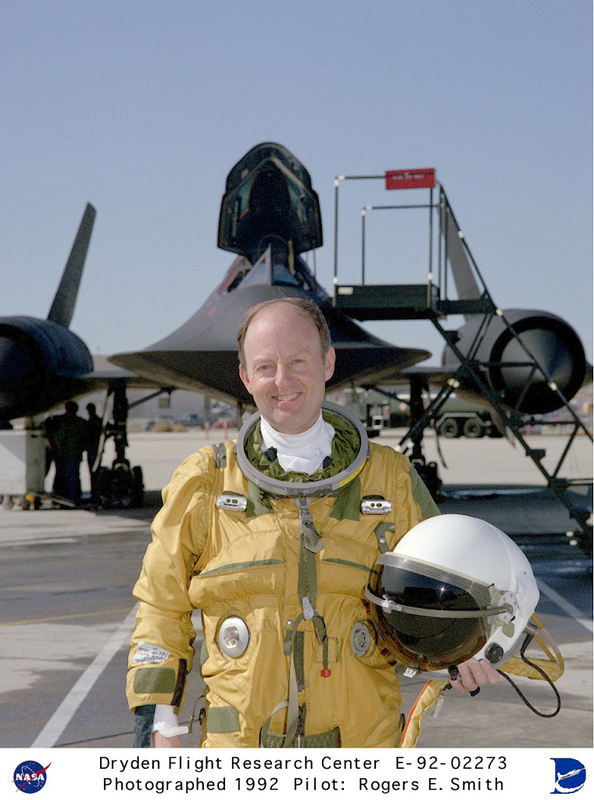 Rogers was one of the two original NASA research pilots assigned to the SR-71 high speed research program at NASA's Ames-Dryden Flight Research Facility (later, Dryden Flight Research Center, Edwards, California. Smith has been a NASA research pilot at Dryden since 1982. Data from the SR-71 program will be used to aid designers of future supersonic aircraft and propulsion systems. The SR-71 is capable of flying more than 2200 mph (Mach 3+) and at altitudes of over 80,000 feet. Description: Three SR-71 aircraft were used at different times during the 1990s by NASA as test beds for high-speed and high-altitude aeronautical research. The aircraft, two SR-71A and an SR-71B pilot trainer aircraft, have been based here at NASA's Dryden Flight Research Center, Edwards, California. They were transferred to NASA after the U.S. Air Force program was cancelled. .
Keywords: SR-71; Dryden Flight Research Center; U.S. Air Force; sonic booms; Jet Propulsion Laboratory; LASRE; YF-12; Dave Lux; Steve Schmidt; Lockheed Skunk Works; Lockheed Martin; Pratt & Whitney; Rogers Smith; Blackbird; mach 3; high speed research; supersonic research.